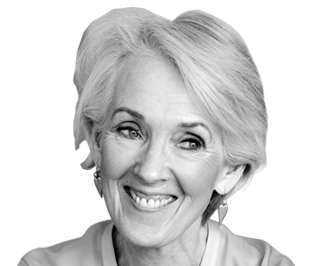 On March 25th, at The Pavilion Theatre, in Dún Laoghaire, Joanna Trollope will be in conversation with Paula Shields. Join Joanna as she talks about her new book, City of Friends. and her writing life. Click Here for more information. You or a loved one could become a named character in my next book with the National Literacy Trust’s online auction, which is now open for bidding! Your bids will raise vital funds to help children from deprived areas develop a lifelong love of reading. Become part of the story at: Click here. Joanna writes a Diary for The Spectator. In Joanna Trollope’s diary, she writes of her yearning for northern landscapes, and also the Welsh Brexit mystery. Read how Joanna’s diary is of a journey of observation and celebration. Click here. Joanna’s new novel City of Friends is Number One!! How fantastic! Joanna’s novel – City of Friends is this week’s No. 1 best seller! There is much celebration as Joanna’s new novel, City of Friends, topped the Neilsen Bookscan charts to be the new No.1 Best Seller. Have you got your copy yet? Shop Now! Joanna joins Lucy Worsley historian, author, presenter and Chief Curator at Historic Royal Palaces, and bestselling author Kathy Lette who credits Austen with her wanting to become a writer, in pledging their support to Jane’s Fund during this significant year as the Museum’s 2017 ambassadors. At Number 2 in the Fiction Hardback Charts! Great News! Do read the Culture magazine of The Sunday Times! (subscription only) – Click here – The magazine always publishes the Neilsen book charts in their Sunday Culture magazine – and to great excitement everywhere, Joanna’s new novel, City of Friends, has entered the charts at Number 2, in the Fiction Hardback section, after hardly a week on sale! After visiting Cheshire, Lancashire and Shropshire, Joanna travelled across the Welsh border to Penarth and Monmouth. There was a very warm welcome and Joanna hugely enjoyed meeting everyone. Monday 27th February 2017: Griffin Books hosted a lunchtime event which was held at Glamorgan Golf Club in Penarth. Joanna talked 100 guests about her new book, City of Friends, as well as her writing career, which spans over 40 years. Guests listened to Joanna reading an extract from the new book, and then went to visit each table for a chat, personally signing each guest’s copy of City of Friends. Tuesday 28th February 2017: Rossiter Books welcomed Joanna to the Shire Hall in Monmouth where she spent the evening talking to an audience and signing copies of her new book.